The Delegate River rises below Cob Hill within Errinundra National Park on the north western slopes of Gunmark Range, part of the Errinundra Plateau, approximately 13 kilometres (8.1 mi) east northeast of Goongerah, in East Gippsland, Victoria. 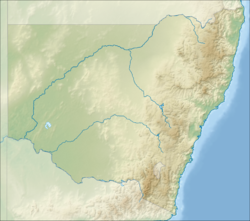 The river flows generally north, east southeast, northeast, north, and then northwest, flowing across the part of the boundary between New South Wales and Victoria, joined by sixteen tributaries including the Little Plains River and the Bombala River, before reaching its confluence with the Snowy River, 9 kilometres (5.6 mi) north northeast of Tombong, north of the town of Delegate and west northwest of the town of Bombala. The river descends 643 metres (2,110 ft) over its 127-kilometre (79 mi) course. ^ a b c "Delegate River". Geographical Names Register (GNR) of NSW. Geographical Names Board of New South Wales. Retrieved 2 June 2013. ^ a b "Map of Delegate River, NSW". Bonzle Digital Atlas of Australia. Retrieved 2 June 2013. "Snowy River sub-catchment". East Gippsland Catchment Management Authority. Government of Victoria. "Snowy River - Catchment Map" (map). East Gippsland Catchment Management Authority. Government of Victoria. East Gippsland Catchment Management Authority (2013). East Gippsland regional catchment strategy 2013 -2019 (PDF). Bairnsdale: East Gippsland Catchment Management Authority. ISBN 978-0-9758164-6-2.